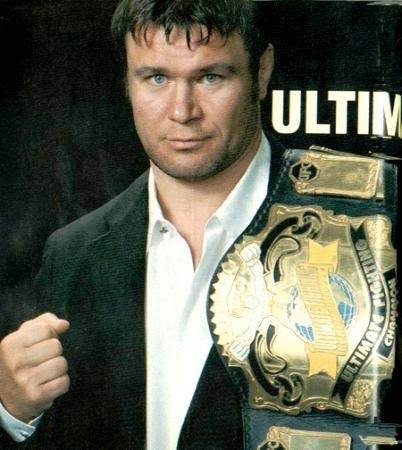 Beneteau, a Canadian, finished second at UFC 5. while Russia's Taktarov won UFC 6. After a stalemate in the middle of the Octagon, the action spills to the mat and Taktarov locks in an Achilles hold for the submission victory at 1:13. Ruas is “The King of the Streets” and won the most recent tournament, UFC 7. Hackney, 37, is 2-1 and known as "The Giant Killer." Ruas' age is undisclosed. "Brazilian men are like American women; they don't like to tell their ages," Beck explains. After 90 seconds of circling, Ruas rushes in, takes Hackney down and puts him away with the rear naked choke at 2:39. Beck hypes UFC 8, featuring Ken Shamrock vs. Kimo in a superfight and a "David vs. Goliath" tournament. "It's going to be tonnage vs. technique," he said. Jeff Blatnick interviews Kimo, who says martial arts is developing into a sport, not just an "exercise." The announcers doubt that "Pit Fighting" is a thing that exists. Severn gets a takedown and pummels Abbott on the side of his head. Severn uses his wrestling to keep Abbott on the mat. Severn is dominating, but he can't get any kind of choke to put Abbott away. He starts drilling Tank with knees against the cage. With three minutes left, Abbott finally rises to his feet. He throws a few elbows, but by the time he breaks free of Severn's waistlock, he throws one punch and time expires. All three judges write "Dan Severn" on their Jiffy-Pop popcorn lids, and "The Beast" is in the finals. After a cautious start, Taktarov pins Ruas up against the fence. Ruas finds more success on the mat, and Oleg is bleeding above the right eye. Oleg fires back with a great left and right, and he goes for a guillotine choke. However, McCarthy breaks it up and has the doctor check Oleg's cut. He's fine. Both men circle for several minutes with little action, and the crowd isn't liking it. Ruas "does not want to fight," according to Wilson, because he's just playing defense. The 18-minute time limit expires, and the judges rule that the more aggressive Taktarov is the winner. Beck interviews Ken Shamrock, who agrees that Oleg rightfully won the fight, even though he had the bloodier face. Shamrock will stick around on commentary for the main event. Severn slaps Taktarov several times, trying to open up wounds from the Russian's last fight. Oleg goes for a kneebar, and Shamrock says it's over. Not quite. Severn escapes. After six minutes, Oleg is bleeding from above his right eye. Severn is totally controlling the fight on the ground, just like he did against Abbott. Taktarov finally escapes with 15 minutes left, and the "cutman" Leon Tabbs examines him, giving both men a breather. After another ground battle won by Severn, McCarthy stands both men up again. Both men are tired, but Severn has more snap on his punches. Severn dominates on the mat until the 27-minute regulation time limit expires. We go to a three-minute overtime, and each man throws a couple of decent punches. Time expires, and the judges rule that Dan Severn is the first Ultimate Ultimate winner!